On February 26 you have the opportunity to participate in Smart City Hub 1, where innovative Smart City ideas are generated and new contacts are created across students, companies, researchers and municipalities. 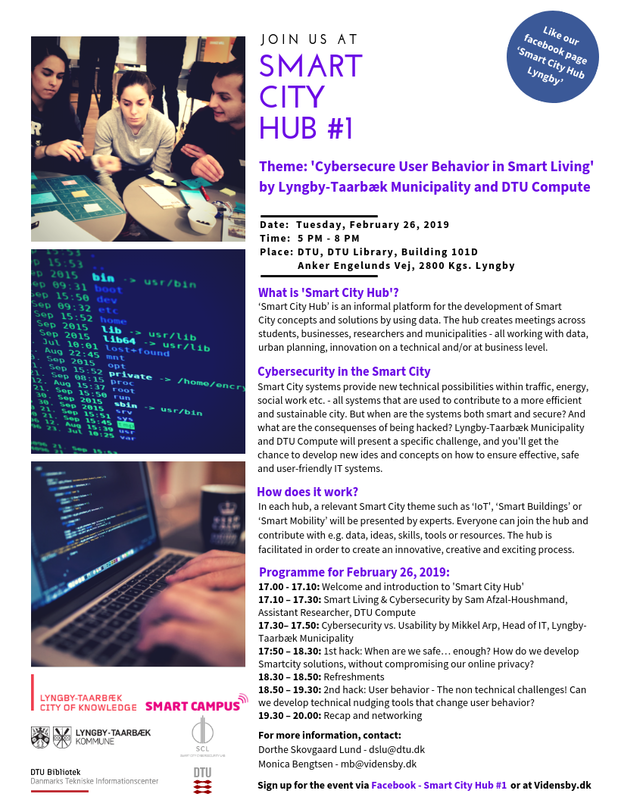 The theme of this year’s Smart City Hub # 1 is ‘Cybersecure User Behavior in Smart Living,’ where Lyngby-Taarbæk Municipality and DTU Compute will present the challenge of the day, related to cyber security and user-friendliness in the Smart City. In the the Hub, the participants will get insight into the consequences of a hacking attack of IT systems, and work on questions on how we can develop Smart City solutions without compromising our online privacy and how we can improve the level of security without losing the ease of use in IT systems. Themes such as supply, buildings, planning and mobility, which will be presented by a company or organization and facilitated by the hub’s facilitator Finn Kollerup. Join the Hub and help develop new concepts in the security of the IT systems in the Smart City. Read more in the invitation and sign up via the form below.